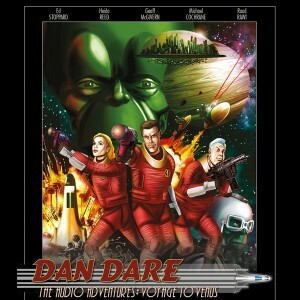 Big Finish Productions and B7 Media team up to bring a classic Sci-Fi character to audio life: Dan Dare! This December sees the arrival of Dan Dare at Big Finish, courtesy of a new audio production from B7 Media starring Ed Stoppard as Dan Dare, Geoff McGivern as Digby, Heida Reed as Professor Peabody, and Raad Rawi as the Mekon. “Ever since my father first introduced me to Dan Dare I’ve been captivated by his space adventures – so brilliantly realised by the creative genius that was Frank Hampson . It also ignited my fascination with mankind’s quest to journey beyond our blue planet and explore strange new alien worlds. With the world of film and television drama now seemingly dominated by American comic book heroes, Dan Dare has always stood out as the definitive ‘British’ comic book space hero — a bright light of optimism that captured the hearts and imagination of a generation. New from Bigfinish Audio The Avengers – Comic Strip Adaptations. 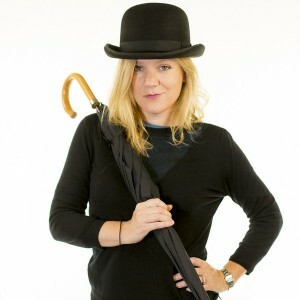 Portrayed on television by Patrick Macnee and Diana Rigg, John Steed and Mrs Emma Peel are back on Audio thanks to Julian Wadham and Olivia Poulet respectively. Big Finish Audio The Avengers – Steed And Mrs Peel: The Comic Strip Adaptations Volume 1, is a hark back to the classy thriller bringing us 4 new stories. This new box-set collects four new stories, adapted from the classic comic strips which appeared in Diana magazine between 1966 and 1967. Steed and Peel return to the scene of an earlier adventure to find it much changed. Now a ski-resort, Castle De’ath is playing host to many new visitors – including a wealthy Prince targeted by assassins. Assigned as bodyguards, the Avengers have to keep the Prince alive and discover which of the Castle’s guests are behind the murderous plot – before they succumb to it themselves. When the phrase ‘sleeper train’ takes on a very literal meaning, Steed and Peel witness the first action of The Miser, a terrifying extortionist. The race is on to stop his ambitious scheme – but in this case, appearances can be deceptive. The ladies of society can’t get enough of Madame Zingara’s Golden Dresses. Especially now their husbands have gone missing. An agent has gone missing whilst holidaying in the Norfolk Broads. With an American nuclear bomb being stored in the region, Steed and Peel can’t take any risks. 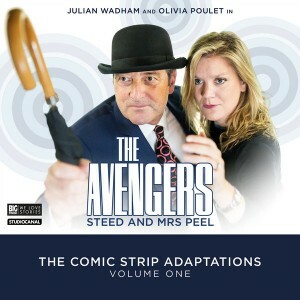 Featuring an all-star cast, including Julian Wadham, Olivia Poulet, Jacqueline Pearce, Sheila Reid, Graham Seed and Phillip Pope, The Avengers – Steed and Mrs Peel: The Comic Strip Adaptations Volume 1 is available to pre-order today from the Big Finish website. 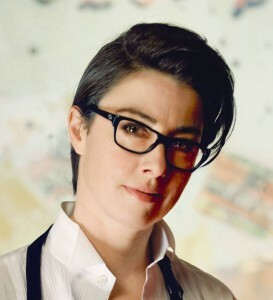 After all the love for a female Doctor we are keeping our #doctorsue Doctor Who campaign open in the hope that Sue Perkins gets to be a TimeLady/Lord in a future series of Doctor Who. #DoctorSue if you will! A bit of history of the original can be found below. 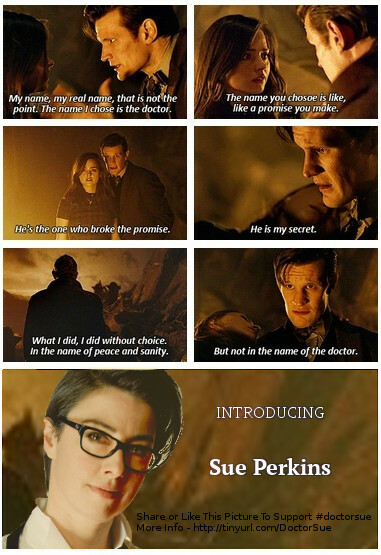 A summary of media attention on getting Sue Perkins into the TARDIS can be found here. 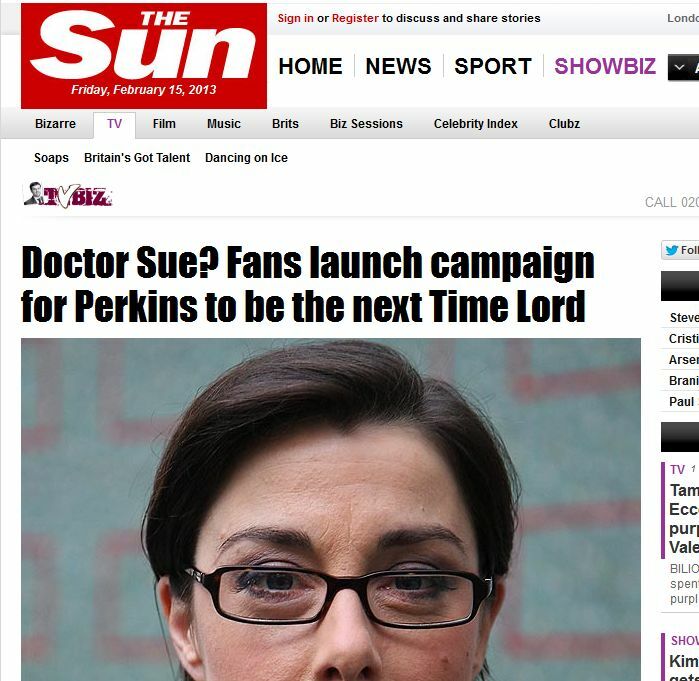 With a focus on TV casting Sue Perkins as the first female (cannon TV) Doctor. Please tweet the following to show your support. Last time we got into The Sun, The Mirror, Digital Spy. Lets see if we can achieve what we started 3 years ago! 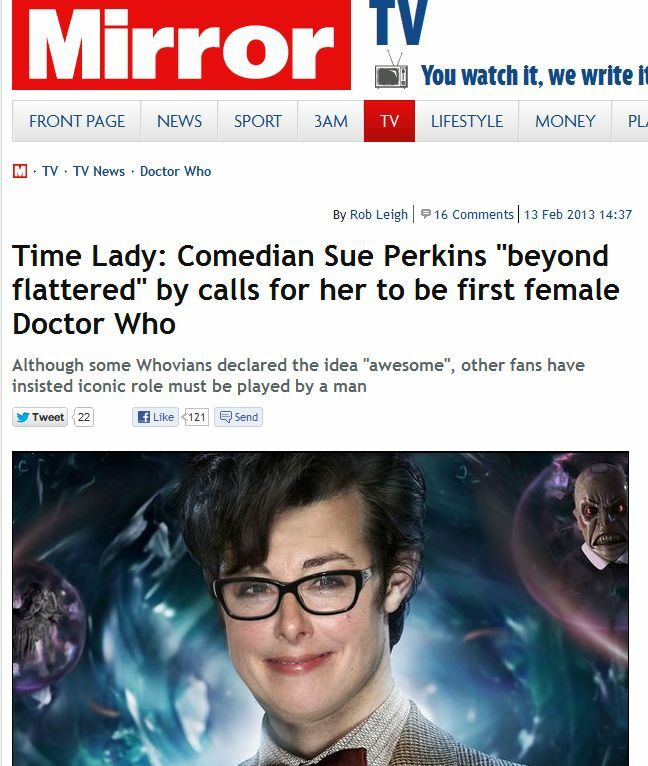 After the media frenzy that was this article that re cast Doctor Who with all Female Doctors from 1963 to the present day we found that there was a LOT of love for the idea of Sue Perkins being the Doctor. We thought we would start a campaign to make this happen. It is not so far fetched as you may imagine. There has been a female Doctor in a BBC licenced story before. Doctor Who Unbound: Exile was an officially licenced audio drama by BigFinish with female actress Arabella Weir as the Doctor. This audio is now 10 years old. 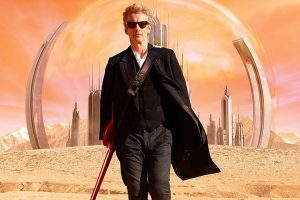 We would love to see Bigfinish restart the Unbound Series and this time have fan favourite possible female Doctor Sue Perkins take the role. 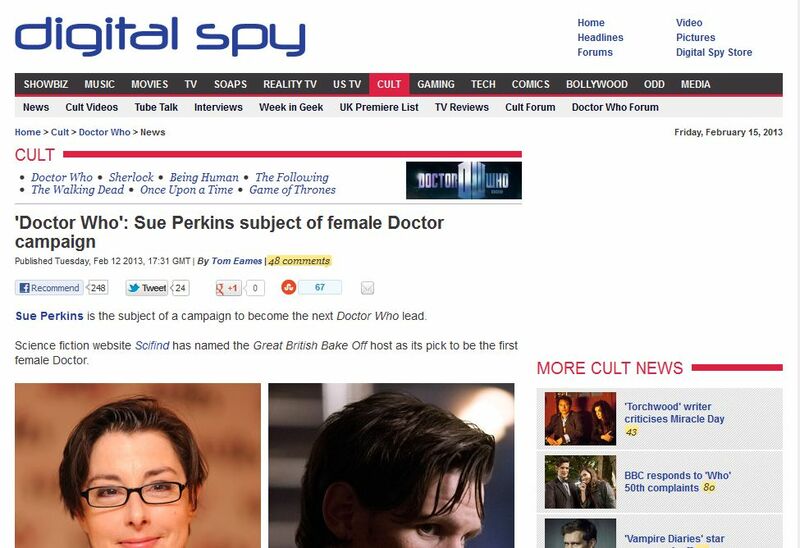 Scifind knows that Sue is a bit of a fan girl with scifi. When she realised her name was taken for a Block in 2000AD she couldn’t contain herself. We feel we need to give this a little push to happen. This middle release in what may come to be known as the Seventh Doctor’s ‘Elder Gods’ trilogy sees Ace and Hex joined by Lysandra Aristedes and Sally Morgan as they hunt for the missing Time Lord. Discovering the Doctor’s abandoned copy of ‘Beowulf’, the quartet journey back to the time and lands of the Danes, though Ace and Aristedes arrive 16 years after Hex and Sally. Their paths converge as a troublesome alien and his warrior robot interfere with the legend of Grendel. Writer Matt Fitton packs a huge amount into these four episodes, and only long term subscribers are likely to follow the story completely, as plot strands from the last couple of years of releases weave into the tale. Morgan does get aome great backstory with flashbacks to her adventures with the Doctor that sound almost more exciting than the main narrative. But newcomers to the Big Finish range would do well to dip into the back catalogue, or at least catch up via TardisWiki. 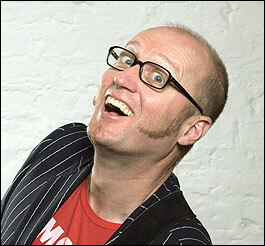 Stuart Milligan deserves a mention for his lively performance as the alien Garundel. Coming across like an escapee from the HitchHiker’s Guide, his scenes do much to give contrast against the slightly more dour Danish characters, and his survival of at least two decapitations is nothing short of remarkable. This is even more of a Doctor-lite release than last month’s Protect and Survive, but the cast don’t let that phase them with some charged exchanges and action scenes. Sophie Aldred is particularly good in her encounters with Beowulf and his court. When the Doctor does appear in flashback, nurturing his infant black Tardis, he just deepens the mystery further. What is the relevance of the Black and White Tardises (Tardi)? Why has the Doctor kept Ace and Hex away from his other companions? And who is the boss of the forge? You won’t get all the answers here, as the end simply sets up a ?conclusion in next month’s Gods and Monsters. Do listen past the closing music though for a chilling ‘end credits’ sequence. Quite how the trilogy will end is anyone’s guess, but if you’ve come this far, you won’t want to stop now. I get the feeling this battle against the Elder Gods won’t finish well for everyone. 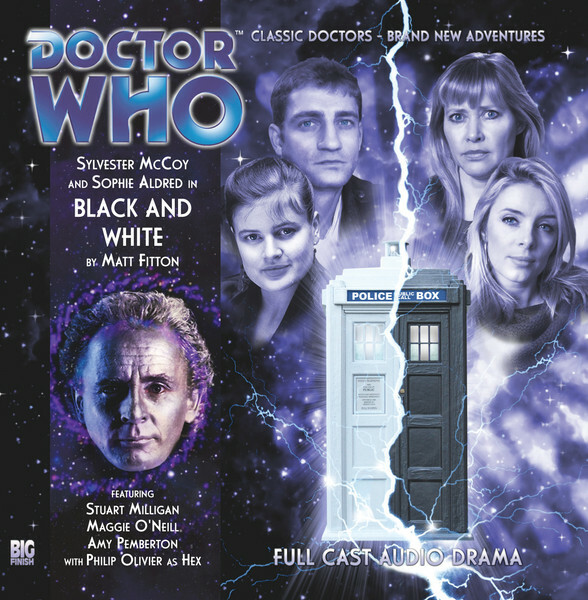 This release is the first of three Lost Stories featuring the Sixth Doctor and Peri. 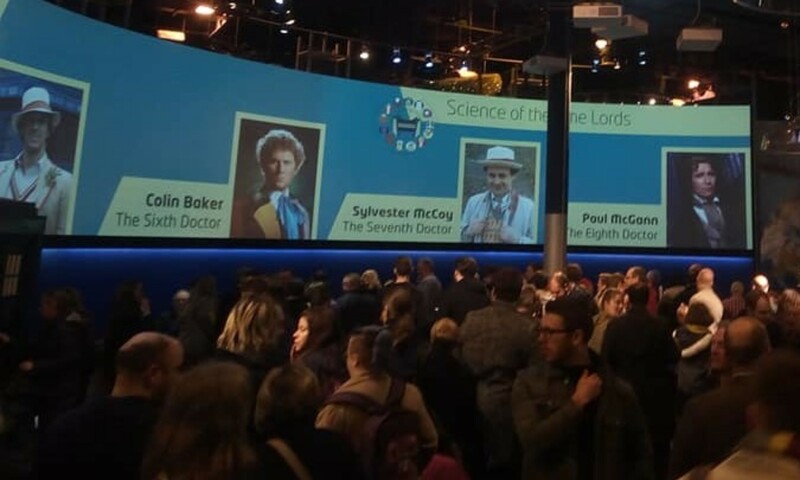 Conceived by Johnny Byrne in the early Eighties for Season 22, as a sequel to his story The Keeper of Traken, internal politics at the time apparently meant his idea never progressed beyond storyline stage. The Doctor and Peri are seeking a holiday destination when they find themselves orbiting Serenity, a planet run by a rich ruling class supported by a super computer Prophecy. The travellers are soon caught up in a revolution that threatens to release the long dormant evil that is Malador. One wonders if Byrne was influenced by Raiders of the Lost Ark, just released at the time of conception, as much of the running time involves the search for Malador’s tomb, with various obstacles and adversaries in the way. The supporting character of Ebbko, a notorious intergalactic thief, is of particular help to the plot here, and Graham Cole’s layered performance of this role is a highlight. Malador himself, played by Stephen Thorne, is an old school Who villain, with shades of Omega and ?other would-be universe botherers. His aim to purge said universe of its sense of good is an interesting one, and Malador’s scenes with the Doctor are tense and involving, even if the outcome is never really in any doubt. Byrne’s story was intended as two 45 minute episodes, and Jonathan Morris’ script extends the tale by a further 30 minutes. This does result in rather a lot of location hopping, which becomes a little confusing at times without visual references to keep track. However Malador’s ?Melkur henchmen, statues who come terrifyingly to life, no doubt benefit here, with the mind’s eye able to draw on a greater production budget than the Beeb could have afforded back in the day. Colin Baker’s Doctor is captivating throughout, with both writer and actor tapping the more lighthearted elements of Sixie’s TV adventures, rather than his darker portrayal of recent Big Finish releases. Nicola Bryant’s Peri remains an excellent foil, redolent of a more simpler, and perhaps more satisfying relationship between the Doctor and his perky female assistants. ?The opportunity to hear more from this great double act is but one reason to applaud Big Finish raising Malador, and this story, from eternal slumber. In this penultimate adventure in the Fourth Doctor and Leela audio drama series, our erstwhile travellers arrive in Derbyshire circa 1979. Amid the rise of Punk, Thatcherism and not a few cow pats, they become involved in the hunt for a missing girl and the strange inhabitants of a village living in fear of the great ?you know what?. Mad as a bag of frogs ? or perhaps mad as a man with a big blue box ? would be one way to describe this audio. The spirits of The Wicker Man, An American Werewolf in London and the later films of Ken Russell all imbue the story and atmosphere, and seem to infect every character, from Rachael Stirling?s Mrs Demesne Furze and the mystery of what she keeps in the trunk of her car, to Michael Cochrane?s Colonel Hugh Spindleton, with his Chieftain tank and team of mercenaries. That this concoction not only makes sense, but is thoroughly entertaining with it, is a credit to writer Barnes and director Ken Bentley. It?s no spoiler to say that this story sees the return of Geoffrey Beevers as the Master, but the nature of his return, and his relationship with the above guest characters, certainly kept this listener glued until the end, or rather, until the cliff-hanger, as this tale leads directly into next month?s final release The Oseidon Adventure. As ever, Tom Baker makes the most of the humour in his part, though Louise Jameson is given her own lighter moments this time around, not least in Leela?s Mexican standoff with the aforementioned Chieftain.? Meanwhile Beevers gives the Master plenty of underlying menace, even if his voice does sound strangely similar to Derek Jacobi?s Professor Yana. The lack of a satisfying conclusion may frustrate some, but with that cliff-hanger due to be resolved in a month?s time, it won?t present as painful a wait as Let?s Kill Hitler did. 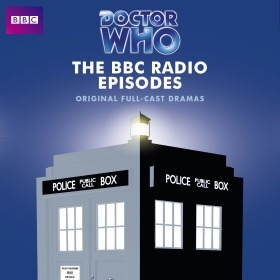 This audio drama, the second in a current trilogy with the Fifth Doctor and Tegan, Turlough and Nyssa, sees the travellers make a rather precise landing on a comet just outside Jupiter. They discover that the comet is actually hauling commercial freight, and the Doctor and Turlough are quickly accused of purloining cargo. Meanwhile, Tegan and Nyssa befriend a mysterious castaway with a boyfriend in danger. Eddie Robson?s script has a fairly straightforward set-up once you get your head around the astrophysics of the conjunction in the title, and the first half of this tale predominantly concerns the Doctor and Turlough facing trumped up charges of larceny. Mark Strickson in particular excels here, and his scenes are a delight. It?s a shame, then, that Turlough?s character is rather sidelined in the second half, as the indigenous Jovians enter the story and a potential civil war threatens Earth. Rebecca Front gives an enjoyable performance as Patricia Walton, head of the comet base, playing the part in a wonderfully understated way while delivering a few droll lines.? But Ben Porter, and in particular John Cummins as Anton Falcao, seem to have their tongues bursting through their cheeks, and this delivery sits rather at odds with a growing darkness in the story. Fortunately Peter Davison and Sarah Sutton keep the drama and tension heightened to the very end and the drama reaches a satisfying conclusion, with the Jovians an interesting addition to the Doctor Who universe. Let?s hope Jupiter reaches conjunction again sometime soon. The historical adventures of Doctor Who’s classic TV series always had a bad reputation. Commissioned to educate the younger viewers, they soon lost out to tales of Daleks, Yeti and the like and a number have been lost to time. What a shame that a writer of John Dorney’s calibre wasn’t around then, as with this tale of the Fourth Doctor and Leela in the midst of Boudica’s war against the Romans, he has fashioned Who’s greatest historical tale ever. A grand claim perhaps, but listen to the evidence. We have Leela learning that valour without honour is simple barbarism. 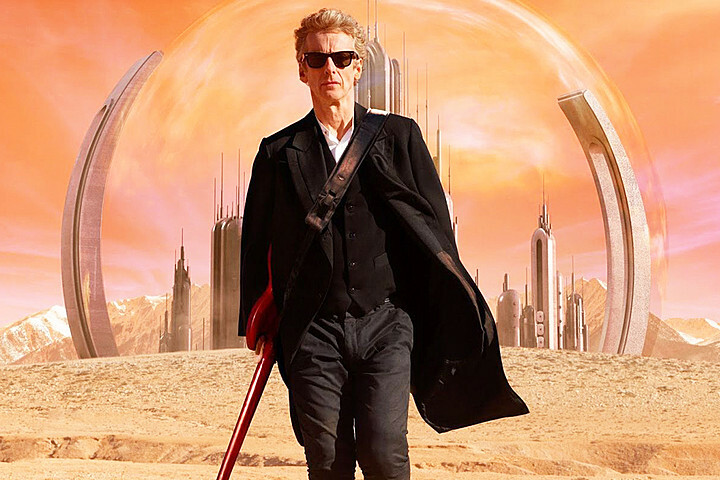 We have the Doctor realising how much he needs his ‘savage’. We have real insight into the complexities of the Roman invasion of Britain. And we have humour, suspense and sword battles galore. 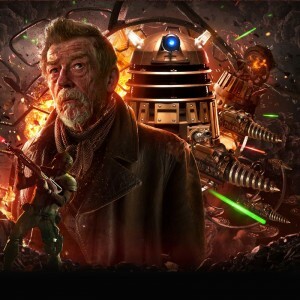 As ever with Big Finish’s productions, the sound design is superb, and the mind’s eye has no difficulty conjuring up the images to go with the spectacular audio. And the performances are uniformly superb, from Ella Kennion as Boudica and Nia Roberts as a conflicted Iceni named Bragnar, to Tom Baker and Louise Jameson exploring depths to their characters and relationship that were never even hinted at on TV. This ongoing Fourth Doctor and Leela series has, at its core, the Doctor’s education of his companion. 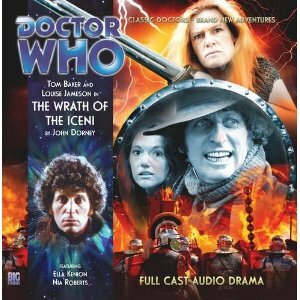 Wrath of the Iceni shows that the relationship of master and student is truly in the balance. Next month, the Daleks return, but I hope another pure historical adventure might be on offer later. The Highlander audio books launched the other year with a series of 4 stories read by Adrian Paul (from the Highlander TV Series) and penned by Cavan Scott, Mark Wright, Jonathan Clements, Colin Harvey and Trevor Baxendale. Series 2 launches at the end of March 2011 and instead of the ‘Dramatic Reading’ style audio books this year we have a full cast. Released as a complete series boxed set series 2 of the Highlander audio series stars Valentine Pelka (Kronos), Richard Ridings (Silas), Marcus Testory (Caspian), Peter Wingfield (Methos), Toby Longworth (Dilijan), Tracy-Ann Oberman (Violetta/Elena), John Banks (Simon/Dorn/Nurse) in stories penned by Scott Andrews and James Moran. When a horrific death occurs at Space World theme park, the Brigadier (the late great Nicholas Courtney) and UNIT are called in – accompanied by the Third Doctor (Jon Pertwee) and Sarah Jane Smith (Elisabeth Sladen).